It's 1808 . . . and Grace loves caring for baby Alice and working with her mistress, Beth, on the property at Rose Hill. Grave tries so hard to be a good servant - but still her master, Tom, doesn't trust her. Does he blame her for what happened to Glory, who is injured and growing sicker every day? Grace has to do something to help, but who can she turn to? Join Grace in the final of four exciting stories about a convict girl who is given a second chance. Sofie Laguna was born in 1968 in Sydney. She studied to be a lawyer, but after deciding law was not for her, she trained as an actor. Sofie is now an author, actor and playwright.Her books have been named Honour Books and Notable Books in the Children's Book Council of Australia Book of the Year Awards and have been shortlisted in the Queensland Premier's Awards. She has been published in the US and the UK and in translation in Europe and Asia. Her picture book with Andrew McLean, On Our Way to the Beach was included in the White Ravens 2005 annual selection of outstanding international children's books by the International Youth Library (Associated Project of UNESCO). 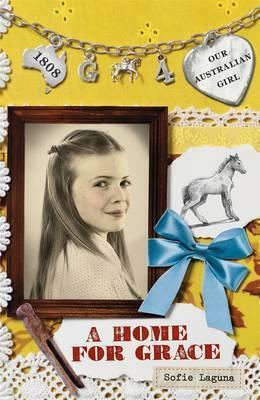 Her other books include My Yellow Blanky, Too Loud Lily, Surviving Aunt Marsha, Bad Buster and Big Ned's Bushwalk.